There’s skills and then there’s SKEEEEELS. Being that we organize and host weekly happy hours for thousands of Zoggers every week where drinking games are the main event, we better be the experts in all areas! 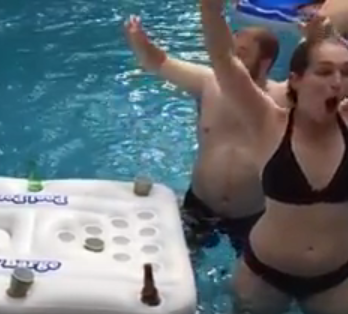 The ZogSports team had a giant pool party yesterday, which obviously wasn’t complete without a floating beer pong table. Leading by example, check out Danielle, our soccer league manager, as she hits her [heating up, on fire] FOURTH CONSECUTIVE SHOT to win the game! Beautiful! You can practically taste the chlorine pouring out of the tears of her opponents as they wade in disbelief. This is ZogSports and we take our fun seriously. You can join the fun, too! Register for a ZogSports coed social sports league and enjoy post-game happy hours each week!